Its going to be colder than a witches ti.....uh in a brass....uh, it'll be really cold here as well. 20-40 below with windchill and its windy today. Truck is staying plugged in but Im not driving it to work. No place to plug it in and Im not going out every hour to fire it up. I'll just drive the cop car, if it dies, I'll take my plate and call Uber. Speaking of plugging it in at work, they allow owners of hybrids to plug theirs in for 4 hours......wheres my measly 110 outlet for my block heater? Bunch of aholes. Supposed to be 40 above in a few days so I figure I'll be washing the EX. Its covered with that evil white stuff.....not snow. so glad i have outlets availabe at work. I'm about the only one who regularily takes advantage. if the temp is below 32, i plug in, doesn't matter which vehicle. As my driver's seat heater is not working, I have purchased a new set of seat heat pads from Amazon. I might have been able to repair my driver's seat, but I also wonder, does the factory heated seat also warm the back? I have Spinal Stenosis and heat on my back would be a good thing. The new heat pads have two separate controllers that I plan on putting where the current heat buttons are, but there is only one control unit for the pair. The buttons have 6 wires each that can easily be extended, and I will use the factory wires to get the power. 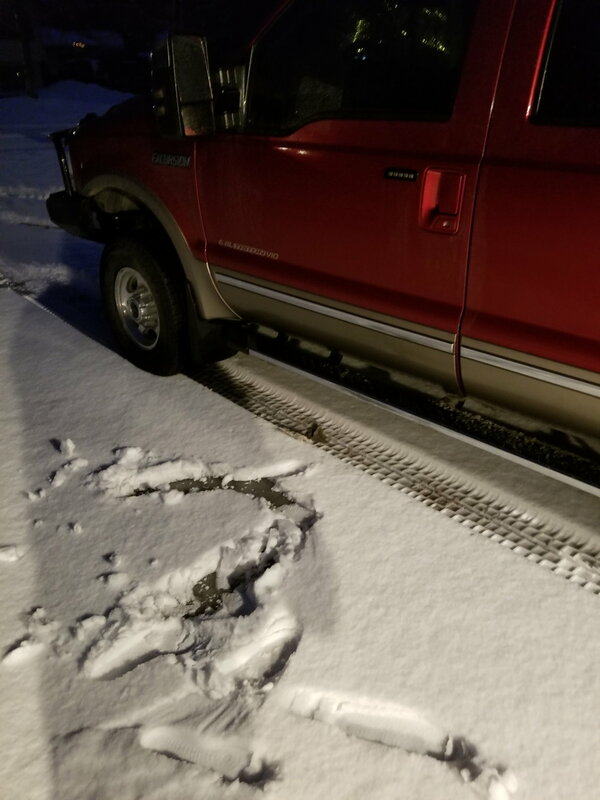 I fell getting out of mine, well more like slipped on wet ice with 3" of snow on top. Jamming my right knee under the drivers door. Hurts like heck and even broke the skin through my Jean's. Ouch.. 35F and raining in AK this evening. Excursion <-- There, I said it. Now, the above couple of posts are strange. In the "I fell" post, there is no pic, but the quote of that post shows the pic. Whats going on here? Yes, the factory seat heater also warms the back with a second pad. Ok, so of both my driver and passenger, only the passenger seat bottom is working. Thanks. I plugged my block heater in. sadly Ford hasn't figured out the electronics yet. a properly designed and running system is amazing. my 2wd 2015 Tahoe was unstoppable in the snow. If I turned off the electronics I'd get stuck. back on, and just drives. very ingenious system. My 2017 Suburban is AWD/4WD and it's outstanding in the snow. Stopping isn't scary either. My X was fun in the snow, but can't hold a candle to the newer stuff. When they work they're better, when they go haywire they're worse. Pick your poison really. There are undoubtedly people who's lives would have been spared if their vehicle had a functioning VSC, and there's undoubtedly people who have died because the VSC went wrong. It's difficult to prove either way. I'm fine with having the systems but I believe they should all be at the driver's discretion. In other news I think the fuel in my excursion gelled. Yesterday I got maybe 1/4 mile up the street and realized I was severely down on power. Tried to turn around but couldn't make it and had to get pulled back. I put some of the red bottle 911 stuff in it but can't get it started back up again. As it's still -26 right now there's probably nothing I can do. I don't have access to a heated garage at the moment. The issue is that the drivers rely too much on the electronics to save their bacon, and then drive at the limits of the vehicle until the electronics fail and they get killed. I for one welcome the electronics, based on a couple of instances where I've lost traction and the car has corrected it before I've fully realized that I've lost traction. I still know how to correct it if I do lose traction, and I share in the frustration at the longevity of them, but for that... stick with honda and toyota. I've driven 300,000 mile hondas with original everything that were better than 110,000 mile chevys or fords in terms of the ABS/ traction warning lights. And yea, sounds like you've got the worst flavor of jello in your tank. The Ford electronics controls have never been good. Electrical systems are top notch just not the programming. In 2015 my manager come over to BS during a winter holiday work requirement and mentioned that he was trying to cut some cookies in the empty parking lot and his (generic Ford SUV) basically shut off and he almost slid into a light pole. 4 of us talked for an hour about how the electronics controls will get people killed. I have not even tried to start my EX. Its plugged in to a timer and gets heat for 4 hours a couple times a day. Its supposed to be warmer this weekend and I'll go hose the crap (salt) off of it. I've been driving the cop car. This morning was the first day of the deep freeze that it groaned while moving. I have a remote starter on it and let it run for about 20 minutes this morning, still ice cold when I got in. This is no way to live. Didn't even try to start it. No need to disturb the molasses.